With the merciful you show yourself merciful; with the blameless man you show yourself blameless; with the purified you deal purely, and with the crooked you make yourself seem tortuous. You save a humble people, but your eyes are on the haughty to bring them down… This God – his way is perfect; the word of the Lord proves true; he is a shield for all those who take refuge in him. (Psalm 18:25-27,30). 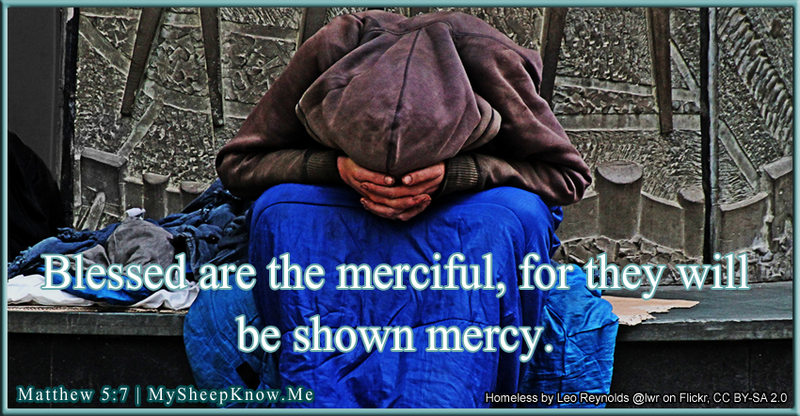 Whoever despises his neighbor is a sinner, but he who has mercy on (or, who is generous to) the poor, happy is he… Whoever oppresses a poor man insults [God], but he who honors [God] has mercy on (or, is generous to) the poor (Proverbs 14:21,31). Jesus taught us by example how we should treat other people. He spoke openly against the Jewish religious leaders, the Pharisees, who felt themselves better than most Jews and certainly the non-Jews because they sacrificed themselves to live according to the many rules they created as interpretation of Moses’ Laws, without ever getting into their hearts an understanding what God really wanted from them. Jesus repeatedly took the Pharisees to carpet because they were following him around trying to catch him in the act of breaking one of their rules. The Pharisees were so concerned about not breaking the letter of the “law” they weren’t performing in the spirit of it, and Jesus called their behavior profane. Similar to how Christians today use certain verses in the Bible as a weapon to condemn homosexuals; this too is profane! They forget that Jesus himself said he “didn’t come to condemn the world but to save it,” (John 3:17) and we are to love people into a relationship with God. God shows his mercy to all those who put their faith in him, both Jew and Gentile, without favoritism. For I tell you that Christ became a servant to the [Jews] to show God’s truthfulness, in order to confirm the promises given to [Abraham, Isaac and Jacob] and in order that the Gentiles might glorify God for his mercy (Romans 15:8-9). For God has consigned [Jews and Gentiles] to disobedience, that he may have mercy on all (Romans 11:32). You who are Gentiles by birth… remember that at one time you were separate from Christ… without hope and without God… But now in Christ Jesus you who once were far away have been brought near by the blood of Christ… [Jesus’] purpose was to create in himself one new humanity out of the two [Jews and Gentiles], thus making peace, and in one body to reconcile both of them to God through the cross… For through him we both have access to the Father by one Spirit (Ephesians 2:11-18). God also shows his mercy to all unbelievers by his patience in holding back on delivering his judgment day until every person has had opportunity to receive eternal life, but he will not wait forever and that terrible day will come. Therefore the Lord waits [in order] to be gracious to you, and therefore he exalts himself [withdraws himself on high, in order] to show mercy to you. For the Lord is a God of justice; blessed are all those who wait for him (Isaiah 30:18).